Recently, many companies have also begun to notice that this linear system increases their exposure to risks—most notably higher resource prices and supply disruptions. More and more businesses feel squeezed between rising and less predictable prices in resource markets on the one hand and high competition and stagnating demand for certain sectors on the other. 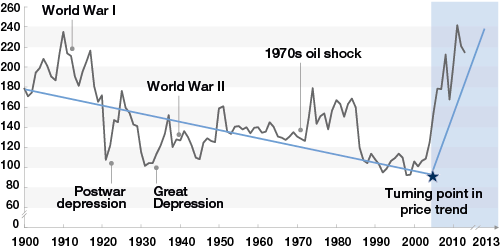 The turn of the millennium marked the point when real prices of natural resources began to climb upwards, essentially erasing a century’s worth of real price declines [Figure 1]. 1 Based on the arithmetic average of four commodity sub-indexes: food, non-food agricultural items, metals, and energy. 2 Data for 2013 are calculated based on the average of the first three months of 2013. At the same time, price volatility levels for metals, food and non-food agricultural output in the first decade of the 21st century were higher than in any single decade in the 20th century.2 If no action is taken, high prices and volatility will likely be here to stay if growth is robust, populations grow and urbanize, and resource extraction costs continue to rise. With three billion new middle-class consumers expected to enter the market by 2030, price signals may not be strong or extensive enough to turn the situation around fast enough to meet this growth requirement. In modern manufacturing processes, opportunities to increase efficiency still exist, but the gains are largely incremental and insufficient to generate real competitive advantage or differentiation. Agricultural productivity is growing more slowly than ever before, and soil fertility and even the nutritional value of foods are declining. The risk to supply security and safety associated with long, elaborately optimized global supply chains appears to be increasing. Many production sites with excessive requirements for virgin resources—water, land or atmosphere— are struggling to renew their licence to operate as they compete in sensitive local resource markets. Against this backdrop, business leaders are in search of a ‘better hedge’ and many are moving towards an industrial model that decouples revenues from material input: the circular economy.4 Analysis of circular setups in manufacturing in Europe shows that the longer-term benefits would be highest in the materials-intensive automotive, machinery, and equipment industries.5 One of the early adopters of the circular economy in the automotive industry is the French car maker Renault. Renault, has adopted circular principles across their business. The following examples illustrate the kind of operational changes they have made, and the economic benefits realised. Managing raw material streams. Renault is moving to maintain tighter control of their raw materials by developing ways to better retain the technical and economic value of materials all along the car’s life cycle. Access-over-ownership business model. Renault became the first car maker to lease batteries for electric cars to help retain the residual value of electric vehicles (to encourage higher consumption) and make batteries fully traceable, ensuring a high collection rate for closed-loop reengineering or recycling. 1 Towards the Circular Economy 1: Economic and Business Rationale for an Accelerated Transition; January 2012, Cowes, Isle of Wight: Ellen MacArthur Foundation. 2 Resource Revolution: Meeting the World’s Energy, Materials, Food, and Water Needs, November 2011, McKinsey Global Institute. 3 Lomberg, B., The Paradox of Efficiency, Carnegie Council, 2011. 4 See for example: Stahel, W., “Service, Performance or Goods”. Circular Economy Network, Ellen MacArthur Foundation, uploaded 1 June 2012 (http://de.slideshare.net/CircularEconomy/service-performance-or-goods-by-walter-stahel). 6 The Circular Economy Applied to the Automotive Industry, July 2013, Ellen MacArthur Foundation. 8 Please see note 1 above. 9 Interview with Jean-Philippe Hermine, Renault’s Environmental Director. 10 Exceprt from interview with Philippe Klein, Executive Vice President, Product Planning, Programs & Light Commercial Vehicle Division of Renault.